Mozhgan: usually people threaten me in numerous ways like casting letters in my house or calling me through mobile phones, they are saying: "stop working in TV dramas or else you will be killed"
I don’t believe Taliban are a social force with an agenda and connected with locality, instead I think Taliban are the harshest form of a resistance movement which is created when the country is in a political vacuum. Their arbitrary and cruel methods of compelling order is imposed when the society fails to find any workable agenda. Taliban are not a unique creation, political history is full of movements which emerged after the ascribed socio-political systems constantly failed, these movements such as Wahabis in early twenty century Arabia are cruel and despotic. Taliban emerged in 1994 after Mujahideen tyranny and failure of half a dozen governments before them. 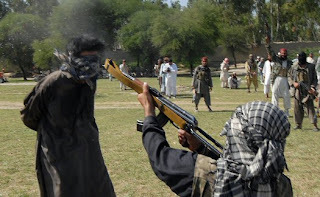 Taliban offered no better life than Mujaheeden, but they were more arbitrary and cruel while Mujahideen were simply corrupt and this is why I think Taliban managed to rule. Taliban are returning again; this time people know what they are expecting, there is no dream and no hope, nobody expect Taliban to be anything else than Taliban. Lutz Rzehak, a professor from Humboldt University in Berlin, gathered data about Taliban in Nimroz Province, a southwestern region, much of it desert, that borders both Iran and Pakistan. Instead of security, the Taliban brought Nimroz a grotesque parody of government. Nimroz is interesting to read because this is not a pashtoon province where Taliban support rests most. when Taliban first captured Nimroz, in first half of the 1990s, they sent in a governor who had family roots in Nimroz but couldn't speak the local language. Like many Taliban, he had been brought up speaking Urdu in Pakistan. For his own convenience, he made Urdu the language of administration. Those who couldn't speak Urdu, which meant most of the residents, were turned away when they applied for government help. There were three more governors between the years 1995-2001. Two of them, both the products of Afghan enclaves in Pakistan, are remembered as barbarous and, when it came to local customs, woefully ignorant. One carried a stick and struck people with it. He also burned down the library, with its 15,000 books. Next came a mullah who concentrated on amassing a personal fortune by running drugs across the border and confiscating property. He fled when the American bombs began falling in November, 2001. Taliban made villagers pay 25% of their harvest to support Taliban war or give a girl to be wedded to a Talib soldier as a prize. Taliban did not organise the community in anyway to implement a public project, nothing was done for the province. Nimroz public know the Taliban very well and they have suffered at their hands, yet they are seeing the return of the Taliban with the same old face. In 2008, sad to say, the revived Taliban are again active in Nimroz. They encourage opium growers and then seize part of their profits. They also deploy human bombs. In recent weeks, Taliban has captured some district centres, kidnapped aid workers; two Taliban suicide bombers attacked in Nimroz, one killed an Afghan soldier and a baby; the other wounded a Canadian soldier. The return of the Taliban sadly means that there is no political force to prevent their infiltration, the collapse of the power structure in the community means the return of the Taliban. Taliban seem to be the default option of the community. Taliban are not raising from within communities like Nimroz but rather extending themselves to it. Nimroz is not a Pashtoon province like Helmand, Kandahar, Khost or many other Taliban sympathetic provinces. Nimroz is neither attractive nor attracting Taliban, the province is at the bottom of poppy production list, a strong tendency among the community or a strong Narcotic business support for Taliban versus government doesn’t exist. Support for Taliban exists in poppy provinces, the community and Business need Taliban to protect them against government poppy eradication attempts. The taxation paid from poppy money helps to foster local Taliban group. The international intervention since 2001 seems to not have affected the social infrastructure nor do the way people live in Nimroz. The moment the government is weakened, doors open for Taliban. It’s a return to ten years ago and what has allegedly achieved by international community made no change to ordinary life or at least the way of living and thinking. All this in a province which is not considered Taliban province, the return to pre international intervention is taking place not because the community prefer Taliban but rather they are understood better than modern form of governments. This could be applied broadly to the country when trying to visualise a post international intervention scenario. Once the international community leave Afghanistan for Afghans, which will clearly happen one day, then the volatile government legacy might not last long. 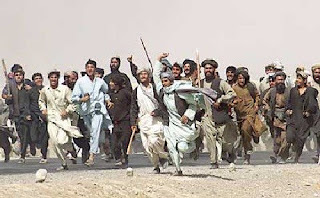 Some will oppose the government because they are not politically represented and they are the Pashtoon Taliban sympathisers; the second half of the country will be run over by Taliban, places like Nimroz, because Taliban can impose themselves on the community than any government system.